Love the ambience of this photo! Perfectly caught in the moment! What a quintessential Parisian picture! The only thing missing is a cafe au lait, …and a beret…and a mime. ;) Great shot! Very interesting mix of textures. I like! Just Beautiful. Love the scarf mixed to the fur, and the wide jeans. Exactly how I picture Paris. So elegant even though she must be freezing! Lovely candid shot. Can’ t help wondering what she’s thinking. I think I’m in love with those petite tables more! This reminds of being a student in Paris and getting my cafe creme and croissant everyday at 7.30. Loved it. Such a pretty picture!! Makes me want to fly back to Paris right away! I must say I was surprised we didn’t get a St.Patricks day post, with lots of greens. She looks cozy, lovely, and cool – all in one. What a beautiful Parisian setting. Love how the gentleman to the right, gazing out the window, stands out. Beautiful. She’s got a lot going on. She’s way busy. This picture is worth a thousand stories. Great shot–A chic moment captured though not at all posed. So wise to go with the B/W. Just perfect. love your black and white photos!! There is always a charm and character exuded by the French that always captivates me. Her best accessory? The empty space where most folks today would have a phone. How lovely to see someone gazing pensively out at the world, not staring into a gadget. Can’t wait for summer and outside cafes. Beautiful photo. she looks stylish and comfy! it’s like time stopped for her. love that it’s black and white. classic. I love people with true emotions. I love the Photo. It looks awesome! “Petit moment de calme” is what I was thinking of when I saw this picture. Great ! Great shot, nostalgie in Paris. what a stunning photo! street style without the posing is just as telling…even when bundled up in a cafe. always refreshing to see original and captivating photos on your blog, thank you! lovely shot. Like the way the lady dressed herself….. cant stop wondering that what she is thinking…. Beautiful and very well captured. I honestly adore the expression on her face! Amazing PIC….love the warm in cigarrette and cold in weather….Super touch in black and white colours PIC. Beautiful black and white photo! I think you are the best photographer also because you can shot pics in perfect moments in a perfect way. This picture is so good that I really feel cold just by watching at her. Beautiful shot! The decisive moment full of mystery and questions. For once, a woman with beauty, true style, grace and sophistication. I love her clothes. Makes me wonder what she is thinking whereas most of the women on here probably don’t think, well, not beyond the next pair of shoes. . . Pity the foreground table legs are cropped off at the bottom – minor detail. Love the black and white. 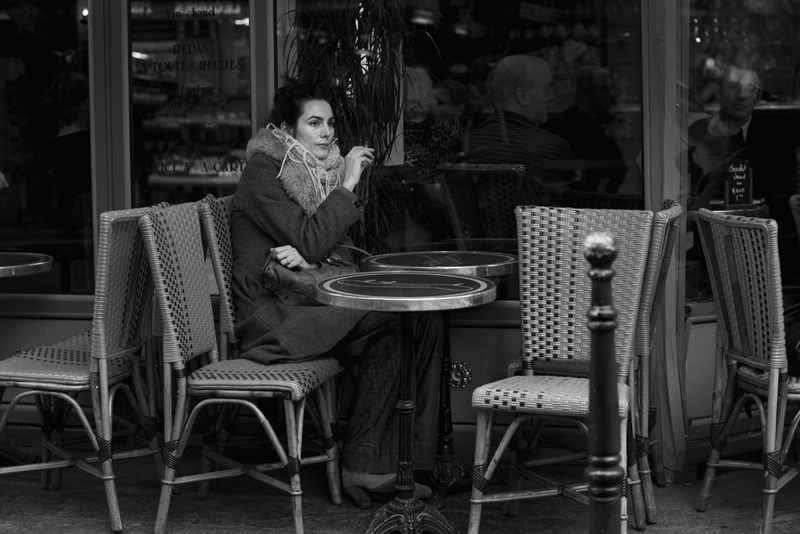 This is one of my favorite ways to experience Paris: sidewalk cafe in winter and a cigarette (and i don’t even smoke!). Beautiful! J’adore the atmosphere of this pic…so parisienne!!!! A great picture! Looks so cool! Paris…past, present and future in one artful photograph. I love this picture, and the guy who is staring at the photographer in the café looks gorgeous ! Très charmant. The black and white is perfect. Only the Parisiennes can manage to look casual and elegant, both at the same time. Im cold just looking at her! Very chic, tho. I adore this photo. I’m absolutely inspired by it. Thanks. Loving her bohemian rugged scarf and fur ensemble! So chic! I always love your b/w pics! She looks like Audrey Tautou a bit :) A very french look, I must admit. I’ve lived in Paris, love how the women dress there! Can’t believe it! Just near my “Ex” Home in Paris. Thanks for this great shoot! J’adore, merci! I lové this picture and the black &white is so elegant!!!! So provacative! I love that there is nothing on the table. the morning after????? very poetic. You Are right Kiran. really nice Replay. Love the quality of photo and the effect that used with. Impressive. Self spoken picture. Just love this. The image speaks for itself.. Speechless..
image speak a lot in herself. A chic moment captured though not at all posed. Very nice and lovely Jaiket . Nice photo, its very cute. Nice image, photo shot done perfectly. thanks for the sharing in your information. Perfectly moment caught in the Camera! i got through your blog so thankyou so much and if you have more blog than please share on the web becouse i like your blogs and product. Its Awesome Pics Thanks For Sharing…. Very well written post. It will be useful to anybody who usess it, as well as myself. Keep doing what you are doing – looking forward to more posts.